The Pump Start Relay enclosure is constructed with a corrosion resistant, UV resistant, shockproof material. The rain-tight, secure, rustproof enclosure provides a safe and secure connection in a housing built to last. This model is 3HP@110 Mini coil 24V Coil 120V. 2 Year Trade Warranty- Factory support up to two years after purchase. Standard, Rain tight, Secure, Rustproof Enclosure- Provides a safe and secure connection in an enclosure that will last a lifetime. U.L. Rated Relay- Ensures that the relays are approved for its intended use. 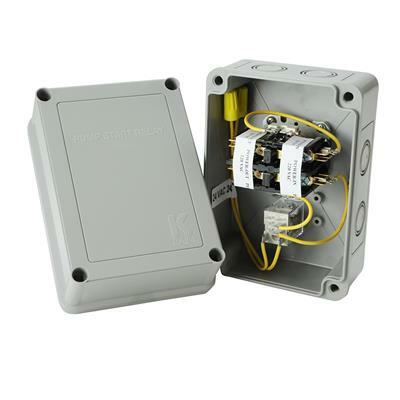 Large Easy Access Enclosure- Provides easy accessibility during wiring. Enclosure has 3 Recessed Knock-Outs- Provides for easy connections. 110 VAC or 24 VAC Coils Available- Provides for a variety of applications up to 7.5 HP.